Attracted to Illinois Wesleyan by the opportunity for original projects in the community, Shin Sawada takes joy in sharing the power of an ancient calculating tool. BLOOMINGTON, Ill.— Shinnosuke (Shin) Sawada gingerly flips the clasps of a thin wooden box and unfolds a floral-print cloth, uncovering a rectangular object that he places on the table in front of him. Possessing a delicate beauty that belies its usefulness, the abacus, Sawada explained, has been used for thousands of years in his native Japan and elsewhere throughout the world to perform quick mental calculations — helping people from merchants to students in their daily lives. Yet the abacus has never caught on as a learning tool in the United States. Relegated to the waiting rooms of doctor’s offices or left to gather dust in a basement, the abacus is seen as a mere plaything. Sawada is aiming to change that perception in the Bloomington-Normal area. An exchange student from Toyko’s Keio University majoring in economics and sociology at Illinois Wesleyan University, Sawada was perplexed by Americans’ lack of interest in the abacus. 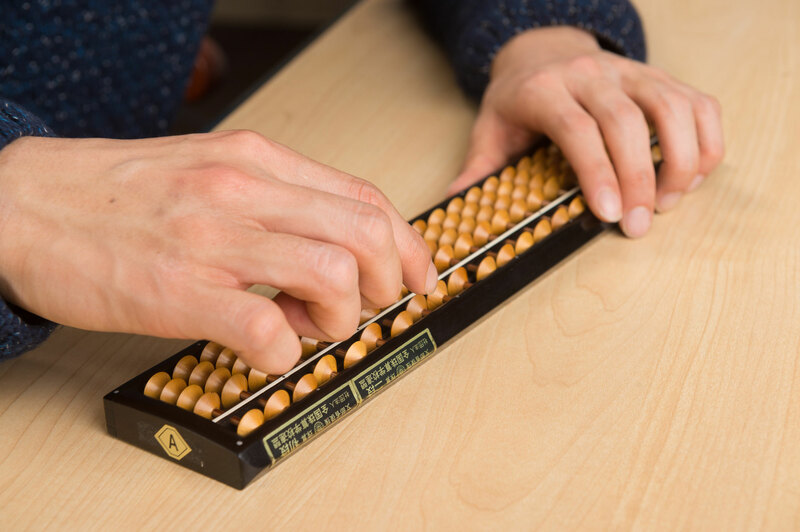 Called a soroban in Japanese, the abacus has been used since the 14th century and is still widely taught in Japanese primary schools — primarily as an aid to faster mental calculation. Using the visual imagery of a soroban, students can arrive at the answer to a problem at the same time, or even faster, than using an electronic calculator. Once Sawada takes on a mental calculation himself, it becomes apparent that this fact is no exaggeration. The playful rolling of the abacus with his hand guiding it along as a skateboard vanishes. Problem number one is 7,263 divided by 415. Three seconds later, Sawada declares “17.501,” with an air of such certainty that a glance at a calculator is hardly necessary to verify his answer. His fingers move over the abacus so quickly it’s difficult to imagine that a calculation is taking place in his mind. When questioned if his prodigious math ability is a natural or learned trait, Sawada hesitates. “A little bit between the both,” he answers with humility, although he demurely adds that he was the National Abacus Champion in Japan at the age of 12. In his first semester at Illinois Wesleyan, Sawada found a way to bring greater appreciation for the abacus to Bloomington-Normal through the Action Research Seminar. This course focuses on bettering the Bloomington-Normal community through innovative student-led projects. Deborah Halperin, director of the Action Research Seminar, asks students to create a community outreach project. Sawada focused on the abacus, and began by teaching other students in the seminar how to use one. Tia Patsavas ’16, one of Sawada’s seminar classmates, points out that even though she had never used an abacus, Sawada made it easy for her to understand. This success in class encouraged him to take the leap from teaching university students to teaching children in the community. The experience also sparked an interest in education issues related to labor and community development. A big attraction for Sawada to study at Illinois Wesleyan was the Action Research Center, its focus on community development and a student’s ability to work on original projects. In ways that surprise even him, the abacus has become a tool that has connected him deeply to the Bloomington-Normal community. He feels real joy when seeing a younger person learn the power of this ancient tool. Even though his coursework with the Action Research Center is complete, Sawada plans to continue to teach the abacus through the Boys and Girls Club. “I’m excited when the children are excited to use the abacus on their own,” he said. “It makes me feel good when they can begin to calculate on their own using it.” He hopes one day to combine his interests in economics and sociology to conduct in-depth investigations comparing community development in the U.S. with that in Japan.